Designed to keep prepared food fresh and hot Food warmers and holding stations are optional accessories that can be used with Frymaster spreader cabinets and fryers to maintain optimal temperature of prepared food. 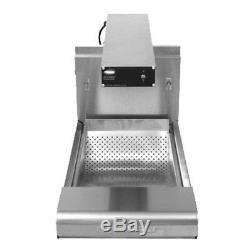 Food Warmers are available separately to fit existing Frymaster spreader cabinets. The rectangular food warmer produces an 18 (45.7 cm) heat pattern over the entire length of the unit to keep cooked food at optimal temperature with radiant heat to assure peak flavor without cooking or drying. The shell is manufactured with durable aluminum alloys and is easy to clean. "ON/OFF" toggle switch, and a 6' (1.8 M) cord set are mounted in the shell. Mounting brackets and hardware are provided for installation. The food warmers are NSF, cULus, and CE approved and can be used with either the cafeteria-style pan with mesh screen or with the perforated, curved scoop pan for quick, easy bagging. Standard Features:- Food Warmer. Durable 6" W x 23-3/4" L (15.4 x 60.3 cm) aluminum alloy housing construction, easy to clean. 750W radiant heat - 120V/60 Hz/1 Ph 6.3 A. Ceramic heating element with wire guard. "ON/OFF" toggle switch on front. (1.8 M) cord with plug Holding Stations. Stainless steel cafeteria pan, 12" x 20" x 2-1/2" (30.5 x 50.8 x 6.4 cm) with mesh screen. Scoop-type, perforated pan, 13-1/2" x 18-1/2" x 5-1/4" (34.3 x 47.0 x 13.3 cm). The item "Frymaster FWH-1 Food Warmer & Holding Station with Cafeteria Pan" is in sale since Monday, January 22, 2018. This item is in the category "Business & Industrial\Restaurant & Catering\Commercial Kitchen Equipment\Storage & Handling Equipment\Heating & Holding Cabinets".